Dustin Johnson hit a 489-yard (447 metres) drive at the WGC-Dell Match Play event – the longest ever recorded on the PGA Tour. There is no video of the mythical drive, so we reenacted the shot … sort of. It turns out there are two catches: Johnson got some help, and the record won’t count. On Sunday, Bubba Watson won the WGC-Dell Match Play event,one of the most popular stops on the PGA Tour since it moved to the Austin Country Club in 2016. 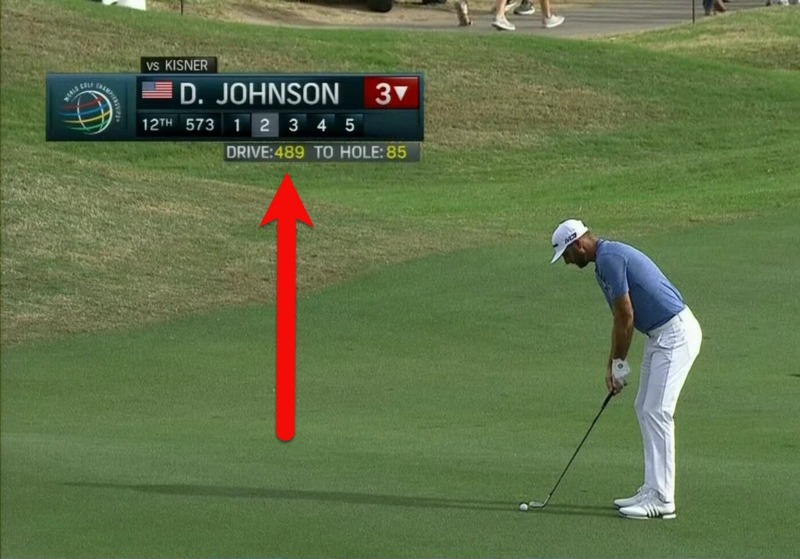 But the shot everybody keeps talking about was Dustin Johnson’s two days earlier. He launched a 489-yard drive, the longest measured on the PGA Tour during the ShotLink era, since official measurements began to be kept in 2003. That’s correct, 489 yards. The ball travelled nearly five football fields and more than a quarter-mile. Sadly, there is no video evidence of the drive. But Business Insider went to the par-five 12th hole to check it out and spoke to some witnesses. Here’s the view from the tee box. The arrow is where the ball came to rest. That’s a long ways away. At the time, Johnson was facing Kevin Kisner, who hit his drive 350 yards. Johnson still outdrove him by 139 yards! Johnson had several factors working in his favour. 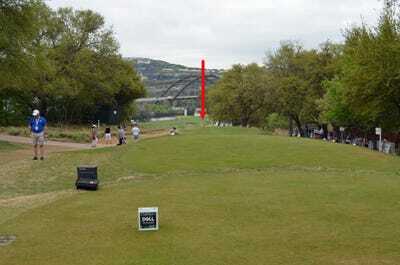 The hole is not only long, but sloped; this is the Texas Hill Country, after all. The tee is elevated 82 feet from the point where the ball came to a rest, and Johnson – already one of the longest drivers on the Tour – had a stiff breeze to his back. But there was also a bit of a catch. 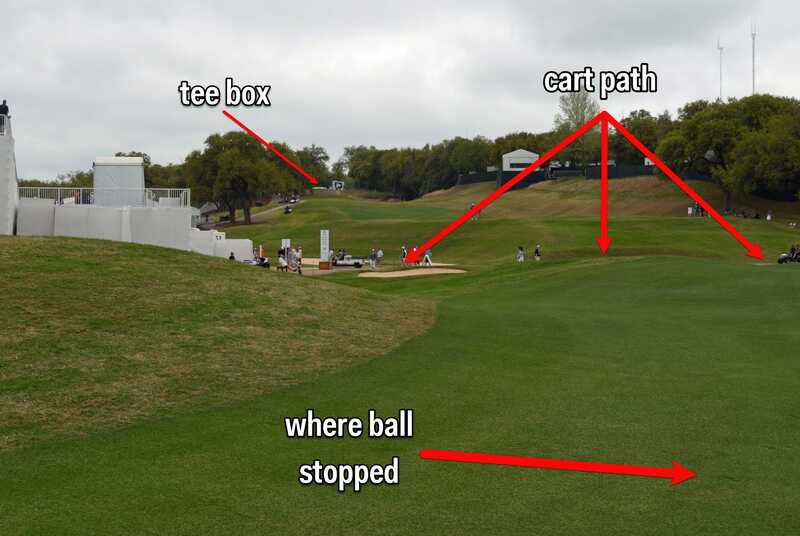 Since there’s no video, what we didn’t see is that Johnson hit a cart path on the fly, according to people who were working at the hole at the time. Now, the road is still 370 yards from the tee. But the ball then bounced and rolled another 119 yards – the length of a football field, including end zones – before coming to a rest. In other words, it was a perfect storm to hit a record drive. But there’s another important catch: The PGA Tour does not recognise records that occur during nonstandard events like the WGC-Dell Match Play. According to the PGA Tour, the longest on record is Davis Love III’s 476-yard drive in 2003.